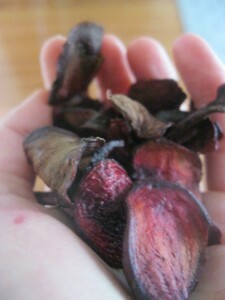 Today I made beetroot chips with the last of my beetroot from the garden. And they were yummy! Simply, slice beetroot very thinly (I used a knife, but you could use a mandolin or a food processor), place on a baking paper lined tray and bake in the oven with a little oil (you could add salt if you wanted). I baked it slowly (because I was doing other things) at 150 degrees for about half an hour, checking them until I get the crunch I desired! *I also did not waste the beetroot leaves: I put the beetroot leaves straight into a slow cooker with some onion, carrot, herbs to make some vegetable stock!